Over $700 worth of Options & upgrades Included in This Special! No Money Down, No Interest payments! $100 Down, No Interest payments! * Call to see if your Your Motorcycle Qualifies? Questions? Call (800) 573-0802 - Available 7 days per week! 'till Midnight! * Our Customers call us "Towing Experts" Get all you need to safely get into towing! * And you still get a Free "Traffic Light Trigger"
Limited time offer! ~ Call Marty for Info! * If Your Area Qualifies..
* Click on above Photo for "Detailed" Pictures! 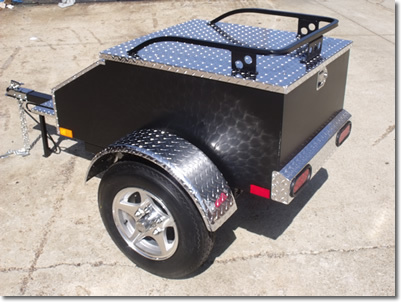 "2018 Rally Special"~ Premium Aluminum Trailer with an Aluminum Frame! * No frame rust ever! * CT-500: $1,499.95 Plus (S&H) - Call to order! 14 Cu. Ft Model, "All * Options" - Call for Freight Quote! * Note: Price subject to change at any time due to increases in raw material! * Look for the Gold Lock on Checkout, top of screen, Just right of Address Bar! 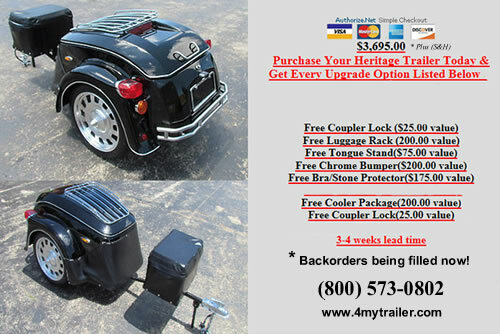 * $700.00 Option Package Included..
For when you need to take along more Stuff! 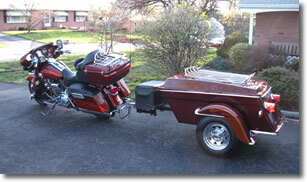 This custom made "Motorcycle Cargo Trailer" ~ $1,399.95 ~ is made to pull along behind your motorcycle. You will hardly know it is behind you! It can carry another 500 lbs. Sometimes to make the trip possible, you just have to have more capacity than your bike will hold. Fully locking lid, with extra luggage rail! License Plate Display & L.E.D. Light Kit! Gas operated strut for Top! The box is constructed of welded aluminum. The sides are powder coated black, aluminum. Shown with the Included Aluminum Wheels Option! * Click on photo above for more details! **Sailings to Alaska are Wednesday’s and Friday’s. Average transit time for this shipment is 30 - 45 days. CT-500, All Diamond Plate 14 Cubic Ft. * Filling Backorders now! Call to see when it's on Sale! 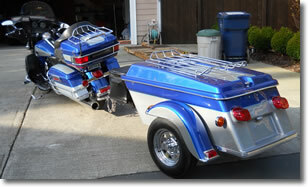 The Perfect Trailer to pull Behind your "Trike Conversions", Hot Rods & Small Cars! Visit our CUSTOMER PHOTO GALLERY! 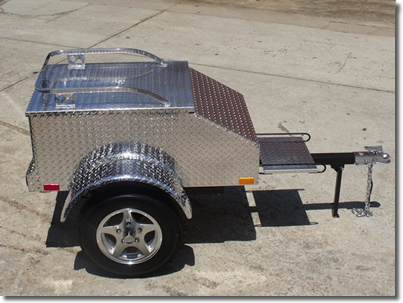 * Or would you rather build your own trailer? Get on the road for a low cost! Fiberglass Body Ready to Paint! This is what you could make! 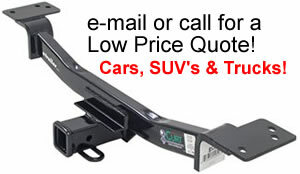 Take a look at the Catalog, and give us a call to order your "Parts List" * Ask For Marty! This is our "Least Expensive"
*Only available to lower 48 States. 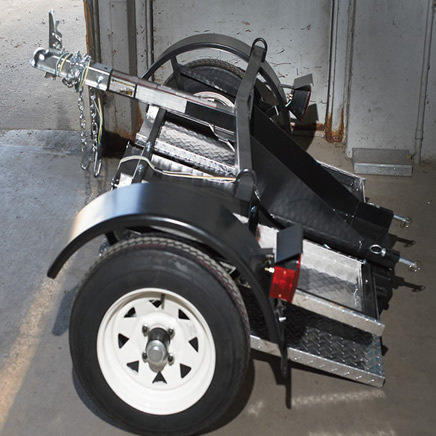 Don't pay thousands more for a tow-behind motorcycle trailer when you can buy this 600 lbs. 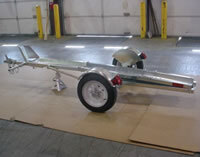 capacity trailer at our great low price! carpeted interior to protect your gear, LED lit interior and rear lights and eight-spoke 12” chrome wheels. 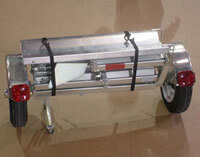 The trailer is mounted on a strong steel powder-coated frame. The 1-7/8” coupler easily connects to any standard motorcycle hitch. And best of all - each trailer includes a title, so it can be legally registered in all states. 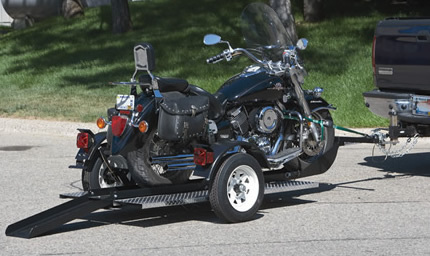 This motorcycle cargo trailer hauls up to 600 lbs in the spacious 20 cubic foot watertight storage compartment. 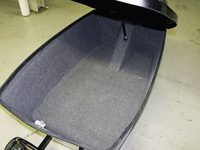 The lockable compartment is fully carpeted, so your gear will ride in style! An interior mounted touch LED light lights up the cargo compartment. 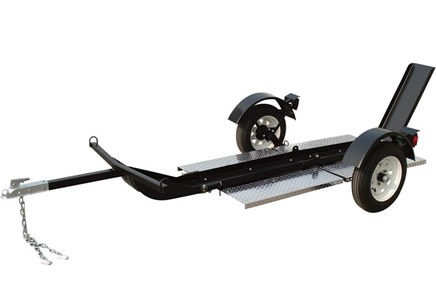 This trailer is built on a rugged steel black powder-coated frame. The independent torsion axle creates a smooth ride. The wheels are 5.30-12 Load Range C trailer tires on five-lug chrome 8 spoke rims. The trailer lights come pre-wired with a standard flat four connector offering a quick plug and play. The trailer has a black enamel finish. Click the pictures for more information! 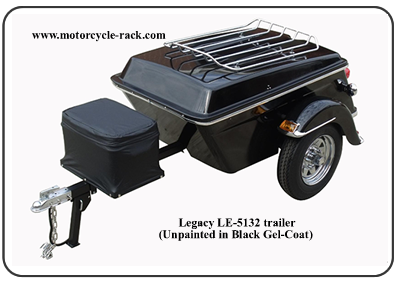 Call for more information or to order this Fiberglass Trailer in "Black Gel-coat"
Closeouts, when they're gone... they're gone! Call for more information on the one you want! SRT-500 - 14 Cubic Ft. Note: These are Brand new! in perfect condition, not blemished or seconds found on ebay! But we will meet any online advertised delivered price on these trailers. ~ Carpeted interior ~ Approximately 60 minutes assembly time. * Special colors: Paint is available from www.cyclecolor.com to match your motorcycle!. & See More about the Stinger here! Full Dress Harley Davidson and Honda Goldwings too! Minimal Assembly required - Approximately 15 minutes!! * For (3) Dirtbikes or (2) Full size Touring Cruisers! 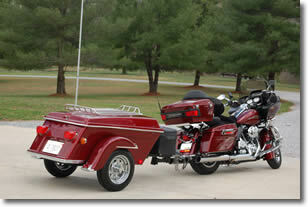 • Transports Goldwing motorcycles, Harley-Davidson, cruisers and sport bikes. • Distance between the outside of each fender - 86.5"
of each fender - 71.5"
* To the closest freight terminal, to be picked up by Customer! * In Black "GellCoat" ready to Paint or Polish! Perfect for Camping Equipment, etc. * The Choice for Nostalgic or Classic Bikes! * This time of year, Snooze you Lose! * Taking Orders for Mid-March Delivery Now! Orders filled first come first served! Air Shocks and Lid Lock like the "Bushtec" Trailers. Stiffer Aluminum Wheel with HD Bearings! * Freight costs can change at anytime without notice! 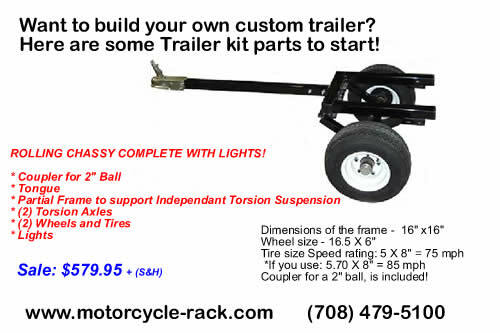 Ask about the "Free" "Traffic Light Trigger"
If you need to trailer your Motorcycle check this out! 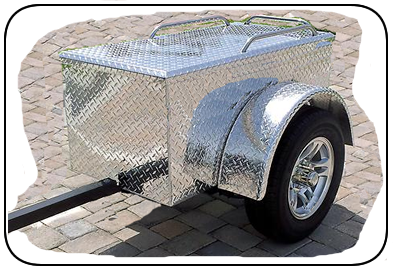 * All Diamond plate aluminum unit is available as an option. Options: 360 Swivel Adapter Order Page! Options: Wiring Converters Order Page! In either with 1 3/4" or 1 7/8" I. D.
Click Photo for details and to Buy Now! Our unit is wired with a Standard Flat (4) Connector, Some Imported and Domestic Motorcycles and Scooters have a (5) wire system, Our wiring converters, shown below, adapt import and domestic motorcycles with separate turn signals and stop lights (5-Wire System) to standard trailer taillight wiring (4-Wire System). In a 5- wire system, a separate wire is used to carry each of the stop, turn, and running light functions to the taillight assemblies. On most trailers, the stop and turn signal functions are sent through the same wire. When looking at the rear of the motorcycle, if the Red tail lights and brake lights are in the same unit, and the turn signals are Yellow and in a separate unit, it is a 5-wire system and a converter will make it easier to hook up. 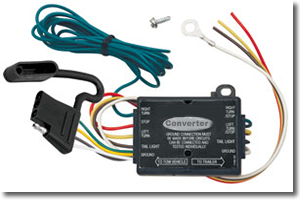 If the Stop, Tail, and Turn signals are all in the same unit and colored Red you have a (4) wire system that is compatible with our Trailer and needs no Optional converter. 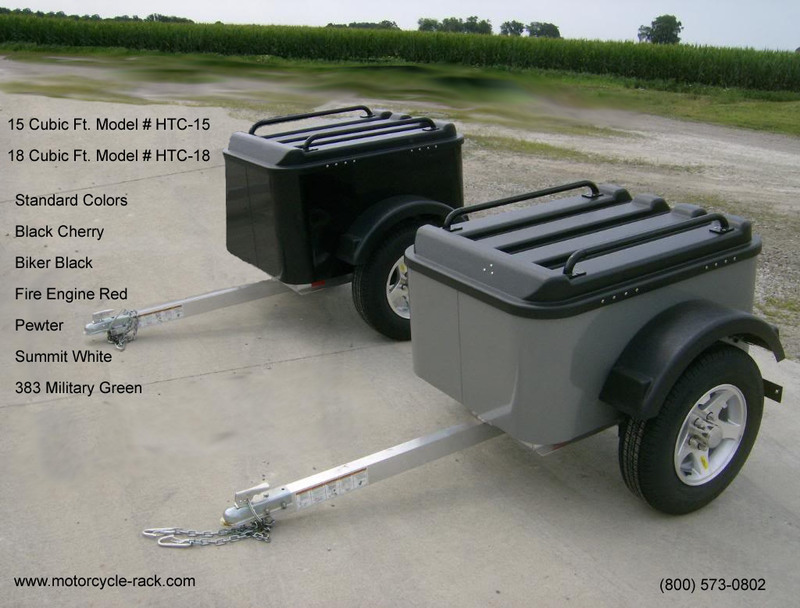 Base Model: Single Wheel Trailer! * To Lower 48 States only! * With upgraded Highway rated 12" tires and wheels included! Allow 10 to 21 days for delivery, some assembly required. $1,199.95 Plus (S&H) * To lower 48 States only! 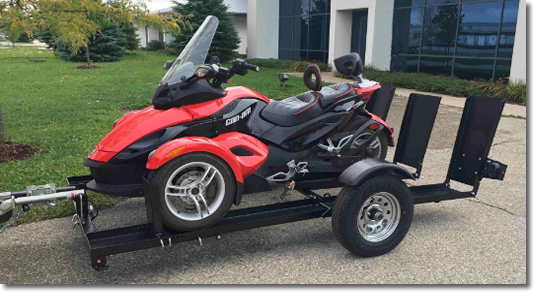 Designed to be towed behind the smallest of vehicles including small cars golf carts, ATV’s and even motorcycles. 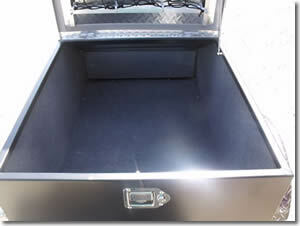 Over 14 cubic feet of cargo storage. Call to order: (800) 573-0802 Specify what color you would like. Max Gross Vehicle Weight: 500 lbs. Electrical: 4 wire flat 12V. 13 1/2” x 23”. Fits most common size coolers. Holes on the side provide convenient tie down points securing cooler. Includes stainless steel mounting hardware. Spare tire tongue mount. constructed from heavy aluminum material. 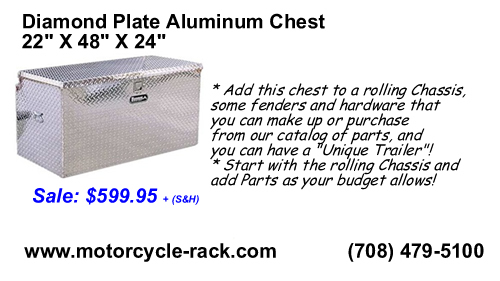 Includes stainless steel mounting hardware and lug nuts. Outer diameter of tire: 28.35in. Allow 7 to 21 days for delivery, some assembly required. Special Order will ship in 30 Days! 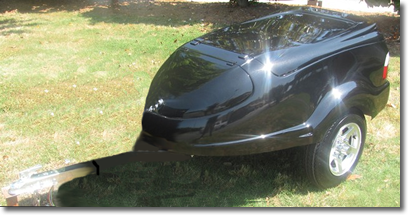 Want a custom trailer, painted to match your motorcycle? Note: We sell at lower than dealer pricing! 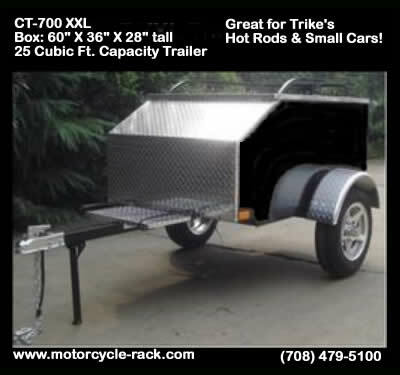 "Click on "Custom Designed" trailers, above to see more"
TMC Presents a "Special Offer" on these Great Trailers! Click Here to View Complete Denray Trailer Parts Catalog, then call to order! 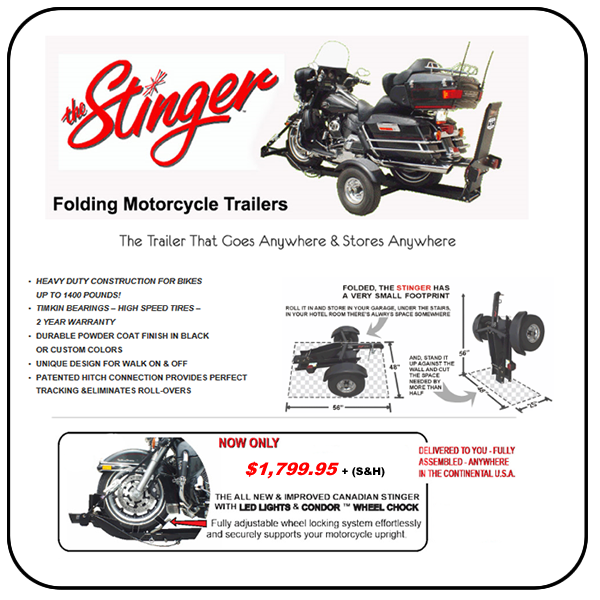 Motorcycle Hitches * Ask about our Special Pricing! We Supply hitches for Most Motorcycle Brands used in the U.S.A.
Hitches for Harleys from 1969 and newer to fit all models. Most hitches are chrome plated with no visible welds. All the welds on Our Hitches are ground and polished. Plus phone number, name & shipping address for a Price & (S&H) Quote! 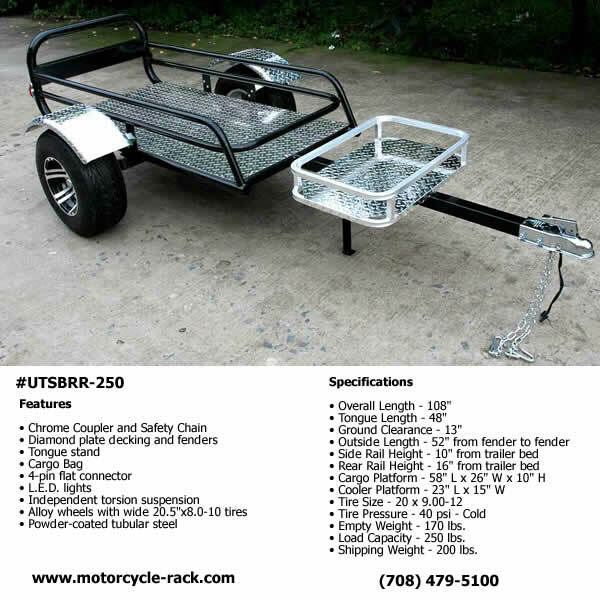 Motorcycle cargo trailer - Info! - Assembly Directions. If you are an avid motorcyclist it is likely that you'll want to consider the advantages of owning a lightweight unit to tow behind your bike. 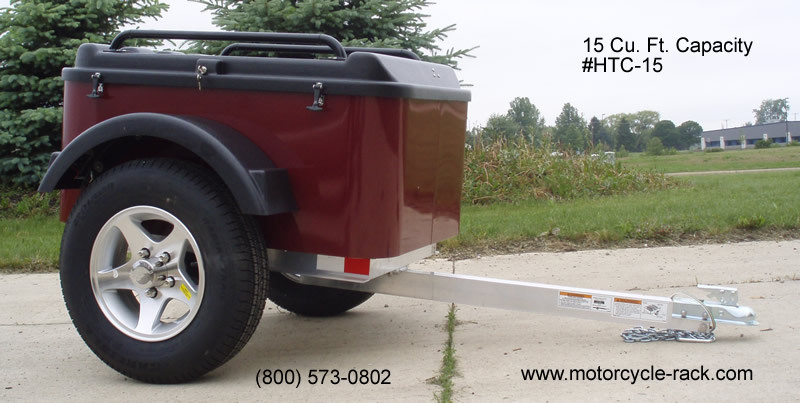 The advantages of owning a pull behind motorcycle trailer are numerous and will enhance your mini, overnight or several day touring or camping trips that you'll make. One thing you will need to consider is where you'll travel with your trailer. Most models are on-road trailers with the ability to travel on reasonable good gravel or dirt roads. 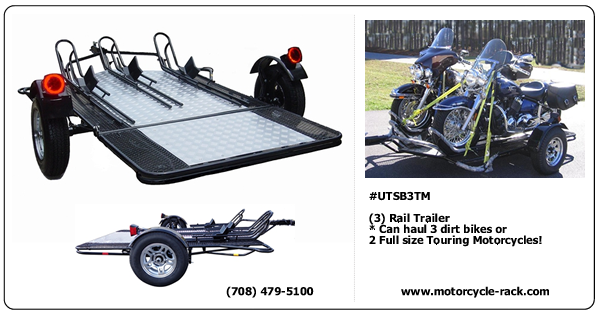 Before you can even begin to decide what kind of pull behind motorcycle trailer to buy, you have to decide what you are going to use your motorcycle trailer for and what features you require in a motorcycle trailer. Safety always comes first! 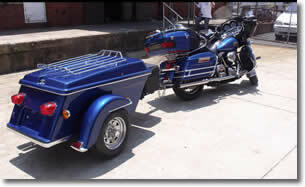 You don't want to end up getting a motorcycle trailer that is too large or heavy for your motorcycle. So, choose a lightweight model under the 200 lbs. range. Cooler rack on the drawbar. 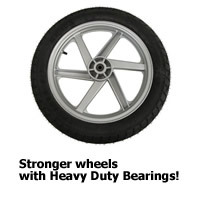 Aluminum Wheels, larger 12” Diameter with larger tires: 5:30 – 12. The latest independent torsion rubber suspension. All Aluminum units are low maintenance. Even though you considered the weight and size of the unit, you need to factor in what the weight will be placed in the cargo section of your trailer. You definitely don't want to overload your trailer or you will have a safety issue on your hands. It is important to always make sure you load your unit correctly, evenly distributing the weight so that you don't create a trailer that is off balance. Other things to consider are if your trailer has high speed tapered bearings suitable for highway use. Ny-Loc nuts used throughout construction to prevent any loosening of bolted on items. 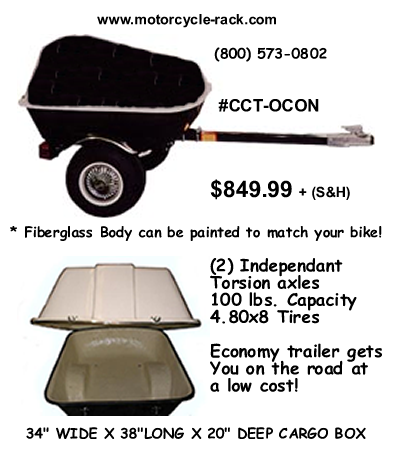 Price is also a consideration when purchasing your trailer. Most people use their trailer 4 to 6 times a year and for the remainder of the time the trailer is stored in the garage or carport. 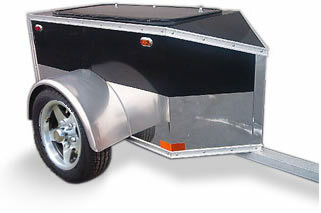 So do you really want to spend more than $2000 for a trailer? To get the best value for your money. You should get something to suit your needs in the range of $1500 to $2000. Shop for the low price on the one that fits your needs. Delivery cost is a big factor, some freight charges are over $300.00 Check for total delivered pricing. 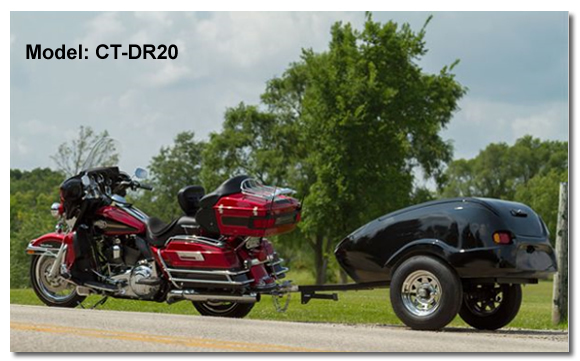 Towing a trailer behind your bike can give you additional freedom when riding your bike. 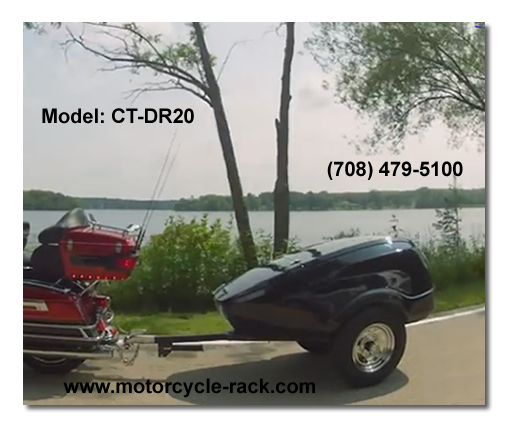 A pull behind motorcycle model can allow you to take a short or long break with the necessities you need to have a comfortable trip without the need to overload the Trunk & Saddlebags on your bike. Note: Photos may differ from actual trailer, lights, carpeting, struts, bumpers may change slightly due to availability. Before you use your trailer for the first time, and before you go on every trip, always check to make sure everything is set to go. Check that all nuts and bolts are tightened securely. Check the air pressure in the tires, (Motorcycle & Trailer) & set to recommendations. Check that safety chains are in place. Always obey all road regulations and laws. 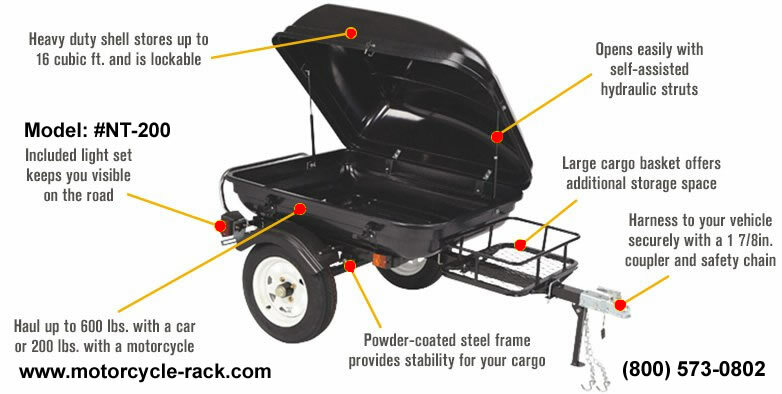 Remember, you are pulling a trailer, and allow extra room for all maneuvers & stopping. The certificate that is used to encrypt the connection also contains information about the identity of the website owner or organization. You can click the lock to view the identity of the website. Also: Secured sites will have an "s" added to the url,( http:// ) resulting in: ( https:// ) to show the site is on secured server, on checkout!